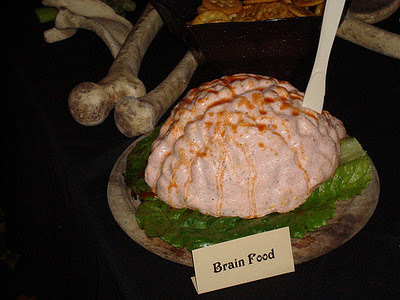 Make a cheese ball and press it into a brain mold, then cover inside of skull with plastic wrap and place cheese ball inside to show exposed brain. 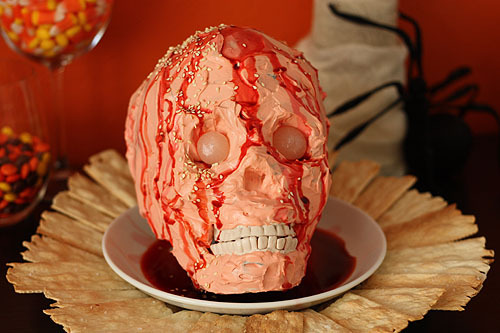 Again let your guests scrap out the yummy goodness straight from the back of the head or off the face. Stir goat cheese and scallions with base mixture in remaining bowl. Form into a ball. 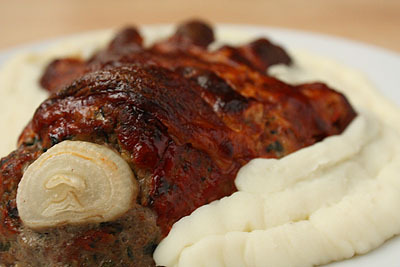 If not using immediately, refrigerate up to 3 days or freeze up to 1 month. Roll in parsley to coat before serving. Serve withcucumber slices. 1 Cut avocados in half. Remove seed. Scoop out avocado from the peel, put in a mixing bowl. 2 Using a fork, roughly mash the avocado. (Don’t overdo it! The guacamole should be a little chunky.) Add the chopped onion, cilantro, lime or lemon, salt and pepper and mash some more. Chili peppers vary individually in their hotness. So, start with a half of one chili pepper and add to the guacamole to your desired degree of hotness. Be careful handling the peppers; wash your hands thoroughly after handling and do not touch your eyes or the area near your eyes with your hands for several hours. 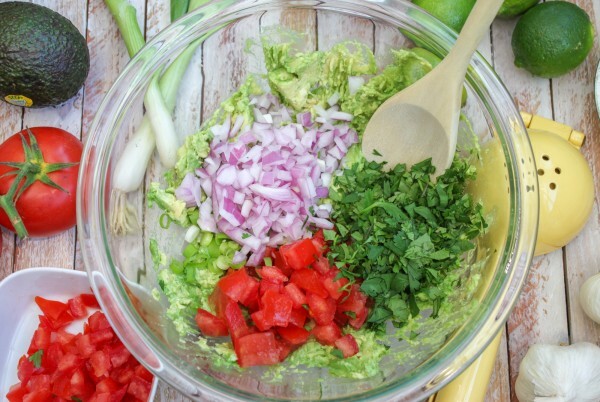 FYI —Chilling tomatoes hurts their flavor, so don’t chop the tomatoes or add to the guacamole until ready to serve. 4 Just before serving, chop the tomato, add to the guacamole and mix. 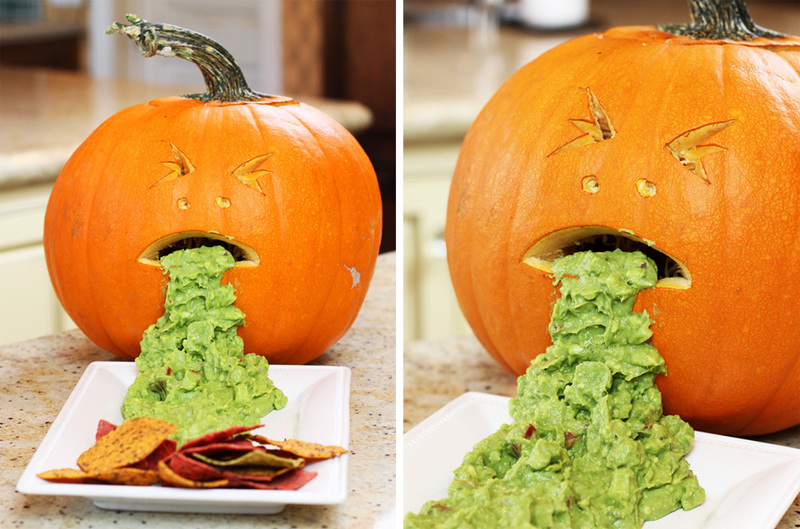 Serve oozing out of the mouth of a pumpkin for that extra effect! This is DAMN good Guac regardless of how you serve it! Slice apples. To prevent the apples from browning dip them in orange juice. Lemon juice is usually used but its sour, and if the kids don’t like sour, orange will do just as well. Both are acidic and both prevent browning. 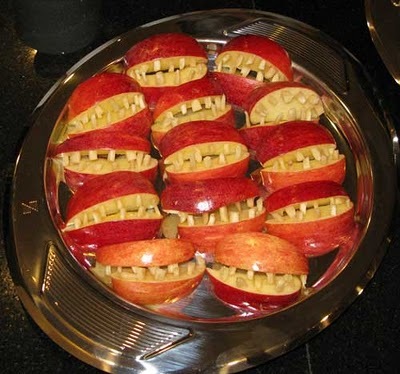 Chop the almonds and stick into the apple slices close to the skin to make teeth. Arrange slices on a platter to make monster smiles!! 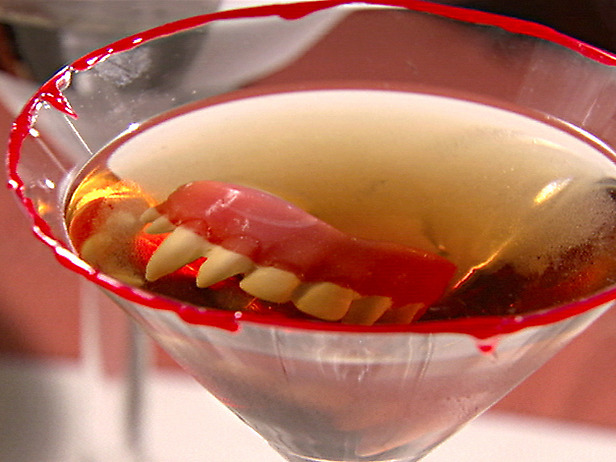 This is a simply Spooky Appetizer. Blanched Almond for the fingers and any Vegi Dip. Here is a dip recipe in case you need one below. After you make the dip and are ready to serve place a dab of dip on the tip of each carrot and apply a blanched almond for the finer nail. 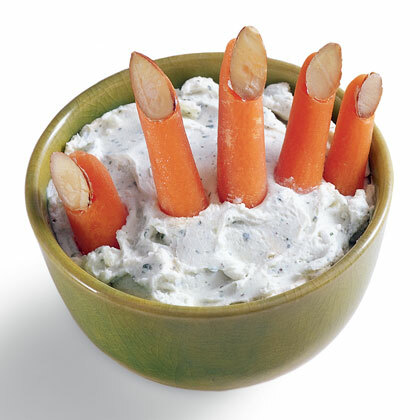 Insert the carrots in the dip as a hand crawling out of the dip. 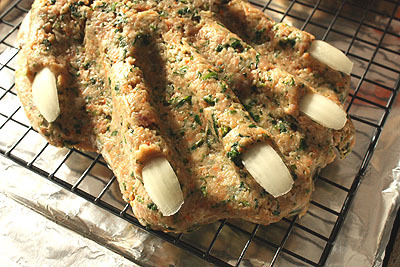 Serve with vegis around for dipping. Mix all ingredients together till combined well. 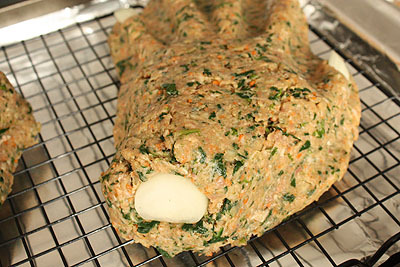 Cover and let chill in refrigerator at least 3 hours (overnight is best). 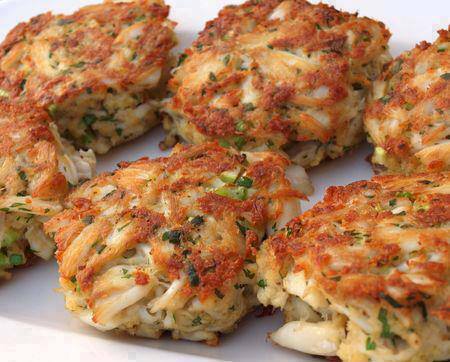 Serve with fresh cut vegetables or potato chips. Prepare cake mixes and bake according to directions (any size pans). Prepare pudding mix and chill until ready to assemble.Crumble white sandwich cookies in small batches in blender, they tend to stick, so scrape often. Set aside all but about 1/4 cup. 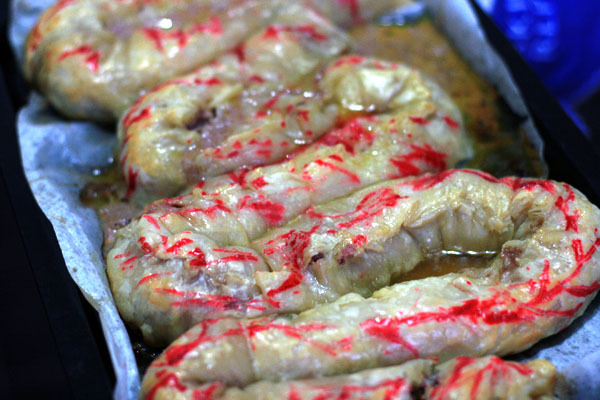 Put three unwrapped Tootsie rolls in a microwave safe dish and heat until soft and pliable. Shape ends so they are no longer blunt, curving slightly. Repeat with 3 more Tootsie rolls and bury in mixture. Sprinkle the other half of cookie crumbs over top. Scatter the green cookie crumbs lightly over the top, this is supposed to look like the chlorophyll in kitty litter. Heat remaining Tootsie Rolls, 3 at a time in the microwave until almost melted. Scrape them on top of the cake and sprinkle with cookie crumbs. Now spread 5 of the remaining Tootsie Rolls over the top; take one and heat until pliable, hang it over the side of the kitty litter box; sprinkling it lightly with cookie crumbs. Place the box on a newspaper and sprinkle a few of the cookie crumbs around. 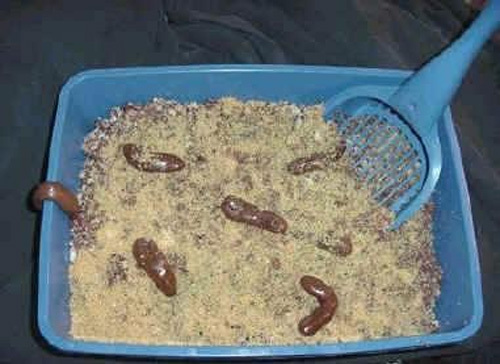 Serve kitty litter cake with a *new* pooper scooper. 4 Slices on Bacon cut in little 1 inch squares. To make the meatloaf mix beef , salsa, refried beans, slightly beaten egg, salt and pepper and crushed Doritos. Once is mixed. Place Mixture in hand mold OR Place the mix on a parchment covered cookie sheet. and shape it as a hand if you choose to do this particular one, using yours as the model. Manipulate it at little into fingers, hand, Radius and Ulna (not much, just a little bit of these last). To make the Radius and Ulna make an indentation on the meat mold and place the cooked eggs in this indentation one next to the other it will resemble bone when cut. Stick a small hunk of the onion into the wrist to resemble the bone, Cover them with more of the beef mix. Cover hand with little bacon squares. Cover the entire hand with aluminum foil and bake for 45 minutes. 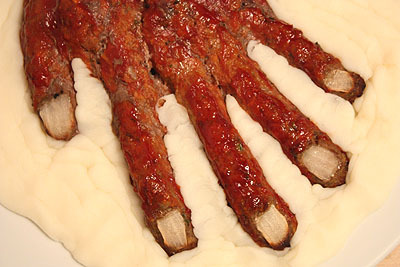 Once the 45 minutes are done, pull it out, remove aluminum foil brush your hand with a mix of ketchup and bbq sauce. After is all covered, brush very lightly on the Mustard mix. Place back in the oven and bake for another 15-20 minutes. 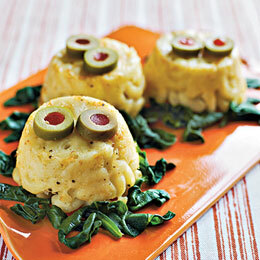 Serve on a bed of rice, mashed potatoes etc to help hide imperfections.